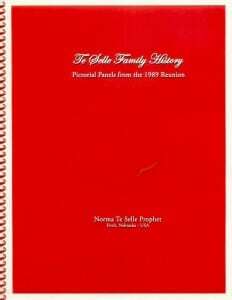 In 1958, Norma Te Selle Prophet began researching the history of the Te Selle family in America. Her dream of a Te Selle family reunion was realized on August 12, 1989, when the “Reunion of Descendants of Three Pioneer Te Selle Brothers” was held in Lincoln, Nebraska. It was attended by descendants of the three youngest te Selle brothers (note the spelliing with the small “t”) who emigrated from the Netherlands, and eventually settled in Nebraska in the early 1870’s. The reunion was attended by more than 230 descendants! Each descendant was registered under the Te Selle brother who was their ancestor. The name tags were also color-coded to help descendants identify other family members at the reunion. 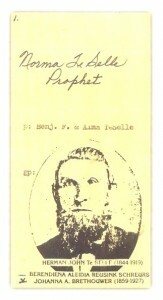 An important part of the Te Selle family reunion was the pictorial panels that were compiled and made by Norma Te Selle Prophet. Several panels were dedicated to each brother, with historical to contemporary pictures, lineage charts, farm production reports, census reports, etc. The panels were displayed at the reunion and the pictures generated a buzz of conversation among “cousins” and descendants who stopped to gaze upon their ancestors and to share their family histories. After the reunion, the panels were stored in the attic at home. The panels were occasionally brought out of storage to reminisce about family history, to respond to a genealogy question, or “just to look” at the panels. While the original panels–made of paper and pictures attached to poster board, with handwritten and typed information (no computer) were safe and sound in the attic, there were no copies of the panels. If the panels were ever damaged or destroyed, the documents and family history displayed on the panels would have been lost. In order to preserve and to share the panels from the 1989 Te Selle family reunion, the panels have been scanned to a digital format for you to view, learn, and share in your family history! This wonderful booklet contains the various pictorial panels that Norma prepared for the reunion. The photos, history, documents, family trees, and other memorabilia are priceless treasures for the Te Selle family to enjoy. All of us owe a huge debt of gratitude to Norma for initially creating these panels, and to her daughter Su Zanna for preserving these panels in a digital format that can be shared with many Te Selle family members for years to come. Note to Reader: Although we do have high-resolution scans of all the pictorial panels, the file sizes are too large to include on the website. The download time for the complete panel image would be much too long to be practical. Therefore, the images you see are compressed files that will load fairly quickly on your device or tablet. However, because of the file compression, if you zoom in on particular images or text, you may find that the detail gets blurry. We are working to create high-resolution images of small sections of each panel, so that you will eventually be able to click on a photo or text area to see a clear, enlarged image of the panel section. We appreciate your patience as we work on that task.